You can now use AWS Secrets Manager with Amazon Virtual Private Cloud (Amazon VPC) endpoints powered by AWS Privatelink and keep traffic between your VPC and Secrets Manager within the AWS network. AWS Secrets Manager is a secrets management service that helps you protect access to your applications, services, and IT resources. This service enables you to rotate, manage, and retrieve database credentials, API keys, and other secrets throughout their lifecycle. When your application running within an Amazon VPC communicates with Secrets Manager, this communication traverses the public internet. By using Secrets Manager with Amazon VPC endpoints, you can now keep this communication within the AWS network and help meet your compliance and regulatory requirements to limit public internet connectivity. You can start using Secrets Manager with Amazon VPC endpoints by creating an Amazon VPC endpoint for Secrets Manager with a few clicks on the VPC console or via AWS CLI. Once you create the VPC endpoint, you can start using it without making any code or configuration changes in your application. The diagram demonstrates how Secrets Manager works with Amazon VPC endpoints. It shows how I retrieve a secret stored in Secrets Manager from an Amazon EC2 instance. When the request is sent to Secrets Manager, the entire data flow is contained within the VPC and the AWS network. Create an Amazon VPC endpoint for Secrets Manager using the VPC console. 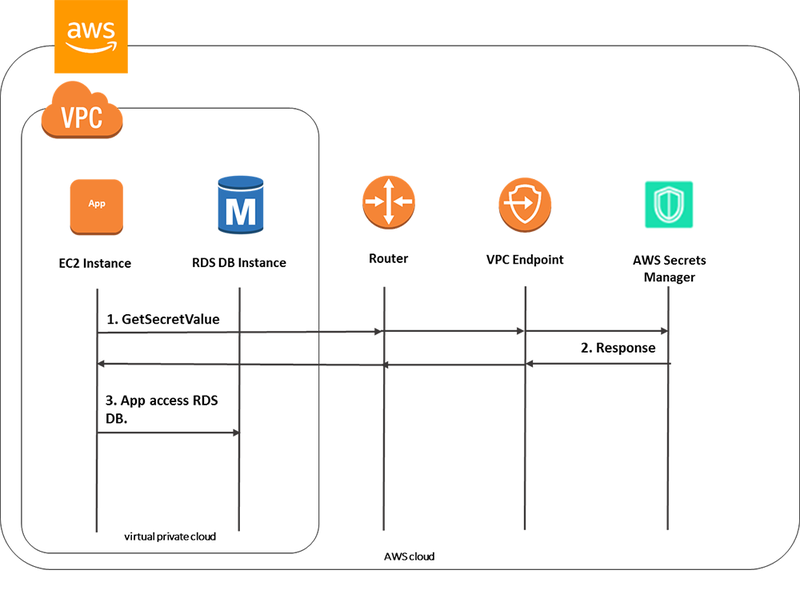 Use the Amazon VPC endpoint via AWS CLI to retrieve the RDS database secret stored in Secrets Manager from an application running on an EC2 instance. 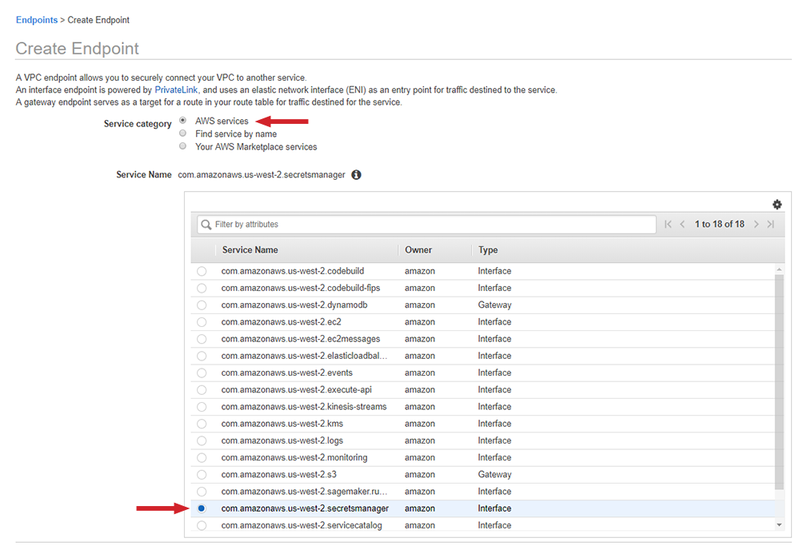 Open the Amazon VPC console, select Endpoints, and then select Create Endpoint. Select AWS Services as the Service category, and then, in the Service Name list, select the Secrets Manager endpoint service named com.amazonaws.us-west-2.secrets-manager. Specify the VPC you want to create the endpoint in. For this post, I chose the VPC named vpc-5ad42b3c where my RDS instance and application are running. Select the Enable Private DNS Name checkbox for the VPC endpoint. Private DNS resolves the standard Secrets Manager DNS hostname https://secretsmanager.<region>.amazonaws.com. to the private IP addresses associated with the VPC endpoint specific DNS hostname. As a result, you can access the Secrets Manager VPC Endpoint via the AWS Command Line Interface (AWS CLI) or AWS SDKs without making any code or configuration changes to update the Secrets Manager endpoint URL. Associate a security group with this endpoint. The security group enables you to control the traffic to the endpoint from resources in your VPC. For this post, I chose to associate the security group named sg-07e4197d that I created earlier. This security group has been set up to allow all instances running within VPC vpc-5ad42b3c to access the Secrets Manager VPC endpoint. Select Create endpoint to finish creating the endpoint. To view the details of the endpoint you created, select the link on the console. The Details tab shows all the DNS hostnames generated while creating the Amazon VPC endpoint that can be used to connect to Secrets Manager. I can now use the standard endpoint secretsmanager.us-west-2.amazonaws.com or one of the VPC-specific endpoints to connect to Secrets Manager within vpc-5ad42b3c where my RDS instance and application also resides. I’ve shown you how to create a VPC endpoint for AWS Secrets Manager and retrieve an RDS database secret using the VPC endpoint. Secrets Manager VPC Endpoints help you meet compliance and regulatory requirements about limiting public internet connectivity within your VPC. It enables your applications running within a VPC to use Secrets Manager while keeping traffic between the VPC and Secrets Manager within the AWS network. You can start using Amazon VPC Endpoints for Secrets Manager by creating endpoints in the VPC console or AWS CLI. Once created, your applications that interact with Secrets Manager do not require any code or configuration changes. To learn more about connecting to Secrets Manager through a VPC endpoint, read the Secrets Manager documentation. For guidance about your overall VPC network structure, see Practical VPC Design. If you have questions about this feature or anything else related to Secrets Manager, start a new thread in the Secrets Manager forum.